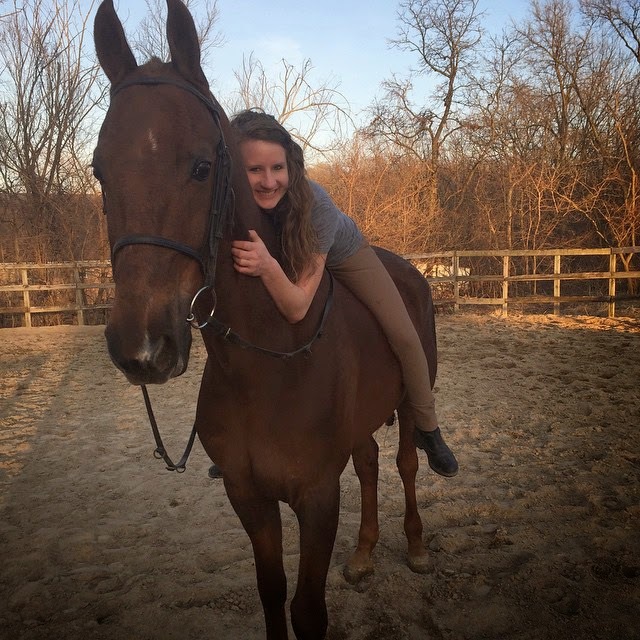 As a life-long equestrian, I know that a successful rider must learn all forms of communication, including the ability to anticipate reactions to sudden changes and the ability to communicate directions non verbally. But because April is Autism Awareness month, I have been thinking how my "barn friend" Nicole applies these skills to a far more noble cause. Nicole is a special education teacher at Easter Seals Therapeutic Day School, with about 6 students on the autism spectrum. Her students vary in abilities and challenges, but she reads the situation and guides them gently. She knows that TS’s meltdowns are triggered if the lights are too bright. She knows that LH doesn’t verbally speak, but has a passion for reading. But with Nicole's knowledge and empathy, each student is reaching new goals. They may be traditional school goals like reading or more basic life skills. One of the student's moms recently credited Nicole for their relaxing family vacation: Nicole had helped her student master the skills needed to sit at a restaurant and wait patiently for the food to arrive, something that many people take for granted. On April 3rd, the State cut autism funding, threatening the support for programs like Nicole's and supports for the children and families at Easter Seals and others across the State. While the funding has now been restored, its future remains uncertain, teetering precariously as the State tries to solve a budget deficit of over $5 billion. The headlines would sometimes have us believe that solving the State's fiscal crisis is simply a matter of eliminating corruption and cutting so-called "non-essential" services. But there is nothing "non-essential" in the services provided to children with autism nor many of the other services on the chopping block. We owe it to all our unsung heroes -- teachers like Nicole-- as well as our most vulnerable children and families to ask our elected officials to adopt a responsible budget for all. 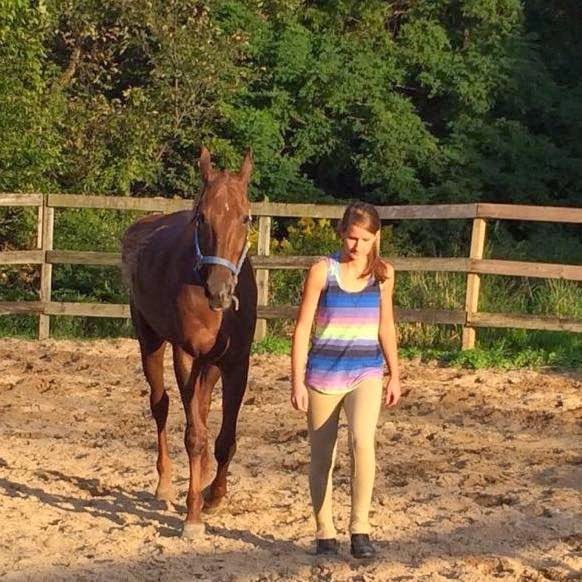 Read more about Nicole's students and autism. *The Easter Seals Therapeutic Day School mentioned does not receive TAP—The Autism Program of Illinois—funds from the State of Illinois; therefore it will not be impacted by state budget cuts. In an overwhelming bi-partisan vote of 81-29, the Illinois House of Representatives today passed HB 4025 requiring high school civics course for graduation. This could not have been done without the help and unwavering support of civics advocates across the state. Later this spring, the civics bill will move to the Senate for consideration. Educating the next generation of citizens was historically a central mission of our schools. We need to make sure it is again. The public knows this – a recent poll indicated that nearly 80 percent of people in Illinois support a high school civics course requirement. Educated, engaged young people are our future. Visit the McCormickFoundation.org for updates on the progress of this legislation. 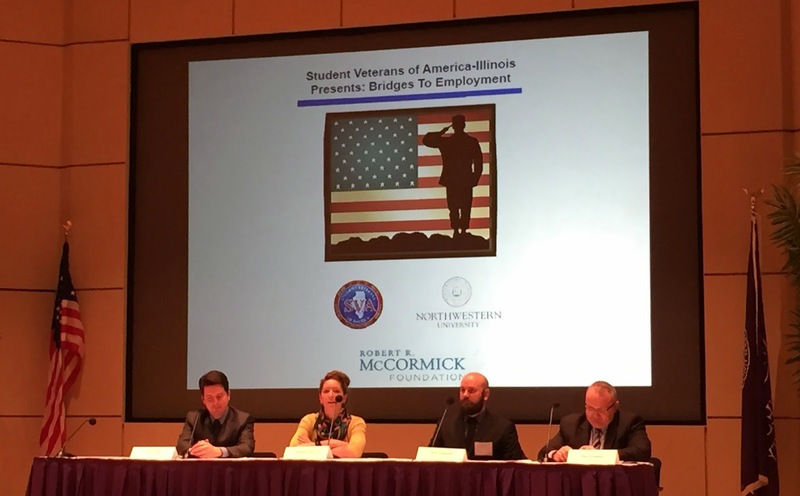 Through the month of March, Student Veterans of America Illinois hosted a signature event series called Bridges To Employment (BTE). The BTE event series assembles executives and senior managers from the public and private sectors to engage in a panel discussion educating veterans on the strengths they bring to future careers. Following the panel, veterans in attendance connected in a networking forum with professional partners to empower student veterans with networking skills necessary to succeed. BTE seminars were designed to arm veterans with pertinent networking skills and provide an opportunity to effectively market their skills. The BTE events took place at colleges across the state of Illinois. BTE visited Northwestern University in Chicago, Northern Illinois University in DeKalb, Southern Illinois University in Carbondale and Illinois State University in Bloomington/Normal. Through the four events over 150 student veterans were able to connect with over 100 public and private sectors and not only work on their networking skills as they finish their degree, but potentially connect with a future employer. Volunteer and informational interviews – I was unsure of what type of work I wanted to do when I left the service. I also moved to a new community where I did not have many connections. While on terminal leave I took the time to get to know my new community and started to volunteer at several organizations to include the American Red Cross, Athens County Historical Society and Museum, and on a small political campaign. This not only gave me a chance to use my skills I gained while in the Navy and to explore some different professional opportunities but also a valuable chance to build relationships with local leaders. These relationships later ended up serving references when I applied for several jobs in the area. Join a network – As more and more post 9/11 veterans return home from service, there have been many networks and organizations that have started for veterans to take part. Even if you are not planning on going back to school right away, look up the local Student Veterans of America (SVA) chapter at a university or college in the area. Team Red, White and Blue is an organization that provides fitness opportunities and an avenue for veterans to connect to their community. Mission Continues offers fellowship and volunteer opportunities for veterans. Make a plan on how to use your Post 9/11 GI Benefits – These benefits should not go wasted and it’s worth taking the time to research how you can best utilize them. Whether it be to go back to traditional school, for a post graduate degree, or a certification - taking the time to do your research on how to best utilize them is well worth it. Making contact to local SVA chapters can be a good resources or seeking out veteran service officers at local universities and colleges. Transitional Employment – many of us do not have a job lined up right away or are not ready to go back to school when we leave the military but income is needed. Many new organizations and companies offer creative ways to get employment while looking for full time work. Locally in Chicago, a nonprofit called Leave No Veteran Behind offers transnational employment and job training. Uber has also entered the space offering jobs to transitioning veterans. In 2015, the Robert R. McCormick Foundation is marking 60 years of fostering communities of educated, informed and engaged citizens. To honor the legacy of our benefactor and continue our commitment to individuals and families in the Chicagoland area, the Foundation is taking on a number of activities that help our grantee organizations deliver on their own mission of service. Our goal is to recognize and incorporate the work of our grantee organizations, building support for their causes in a forward-thinking manner. Chicago’s public broadcasting leader, WTTW/Channel 11, is also marking 60 years in 2015, prompting the Foundation to offer a grant to the station to support their efforts to educate and inform their viewers. Through sponsorship of Chicago Tonight, WTTW’s 60th Anniversary Gala, McCormick Community Screenings and support during upcoming pledge nights, the Foundation is able to actively illustrate our commitment to station programming and events during their year of celebration. Spend your July 4 with festivities at the Chicago History Museum at the south end of Lincoln Park, and step into the new Robert R. McCormick Theater, the new state-of-the-art cinema within the museum. The celebration is a family affair with plenty of activities including face painting, crafts, musical performances and parade. The celebration is free to the public. After the event, Chicago History Museum admission is free for Illinois residents. While the Foundation invites everyone to visit Cantigny Park throughout the year, the events on McCormick Day – Thursday, July 30 – will be most memorable. Annually celebrated as the birthday of Col. Robert R. McCormick, McCormick Day 2015 will offer guests extra special experiences including behind-the-scenes tours, and a free early-evening concert by the legendary Chicago Sinfonietta. Mark your calendars for July 30 at Cantigny! In 2015, the McCormick Foundation is initiating a special partnership with the Donors Forum, the premier resource for networking and education, information and knowledge, and leadership and advocacy on behalf of philanthropy and nonprofits in Illinois. This year-long initiative will address the growing need to help children, adults and families in Chicago’s most underserved neighborhoods, flourish and prosper. Later this spring and summer, the Donors Forum will share the work of local agencies delivering cradle-to-career programs that are allowing residents to become more resilient. Representatives from Thrive Chicago will showcase how local coalition building can build bridges to better lives for individuals and families. In March, Rep. Deb Conroy introduced legislation to strengthen civic education in Illinois. The legislation aims to promote greater civic learning through a required civics course for all Illinois high school students and to support teacher training, the greatest area of need for implementation of a new course. On March 25, the legislation emerged successfully through its respective subcommittees. Because of this we are one step closer to bringing civics back to Illinois schools. Thanks to supporters that submitted witness slips in favor of the legislation. More than 300 proponent slips were filed. This legislation is based on the recommendations of the Illinois Task Force on Civic Education which was established by the legislature to study the status of civic education in Illinois and make recommendations on how to improve it. The Task Force, which I had the honor to chair, was comprised of legislators, educators, school administrators, and community leaders from across the state. Contact your state representatives and senators and urge them to support legislation (HB 4025) implementing the recommendations of the Illinois Task Force on Civic Education. For the past 25 years, the Robert R. McCormick Foundation has partnered with media outlets, sports teams and philanthropic organizations to improve the lives of those underserved and the communities they live in. We would like to recognize and thank our four Fund Partners that have been with us from the beginning – Chicago Tribune Charities, Cubs Care, the Orlando Sentinel Family Fund and the Sun Sentinel Children’s Fund. Together, the Foundation and our Partners have worked closely to help make a difference in the lives of disadvantaged youth, adults and families. The Foundation is grateful for our 14 Fund Partners and the relationships that we have cultivated over the years. Through these partnerships, grants are made to qualified nonprofit organization with programs that help transition low-income children, adults and families to self-sufficiency. To achieve greater impact, the Foundation focuses on supporting children & youth education, literacy, health & wellness, child abuse prevention & treatment, hunger, homelessness and workforce development programs. The important work accomplished by the Foundation and our Partners would not have been possible without the generosity of our loyal donors, readers and fans. With their support and the momentum provided by our Partners, the Foundation has raised more than $500 million, provided matching funds and awarded more than $750 million in grants to thousands of agencies in our Partners’ communities across the country. Together, we will continue to build a stronger community for all of us in the years to come. To learn more about the Foundation’s Communities Program and Fund Partners, or to make a donation to help us continue this great work, visit McCormickFoundation.org/Donate. Illinois Governor Bruce Rauner recently promised a partial restoration of cuts previously made to early childhood education and an increase in funding for K-12 education. However, we are deeply concerned about the proposed budget cuts that restrict access to critical human services like Early Intervention (EI). EI is a critical component of the early childhood and K-12 learning continuum as services are provided in the earliest years to prepare children to enter kindergarten healthy and ready to succeed in school. EI is a voluntary educational program for families with children birth through ago two with disabilities or developmental delays. EI helps support families in promoting their child's optimal development by embedding education and therapeutic strategies into family routines. Research shows that providing EI services to children and families who need it improves a child's overall well-being as well as health and academic outcomes. Governor Rauner has proposed eliminating $23 million from EI by increasing the extent to which a child must exhibit developmental delays to be eligible for services from 30 percent to 50 percent. If enacted, approximately 4,000 children would not receive services in Fiscal Year 2016 (starting July 1, 2015), and Illinois will likely see a 50 percent reduction in statewide services within a few years. Ironically, it is children with mild to moderate developmental delays who actually benefit the most from EI as they are more likely to avoid needing expensive remediation or special education services upon kindergarten entry. It is in the State and school districts' best interests to actually reach more, not less, children birth through age two with mild to moderate delays. Learn how one Illinois family has leveraged EI and preschool services to help their children thrive. Call on Governor Rauner and members of the Illinois General Assembly and urge them to advance a Fiscal Year 2016 budget that provides adequate funding for EI and other early childhood programs so that all children have the opportunity to reach their full potential.